The story of the River Oaks development in the early 1920s is as intriguing as the growth of the “Magnolia City” of Houston itself. 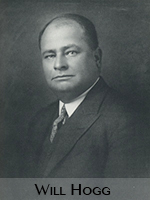 It all began in 1924 when three prominent Houston businessmen, Hugh Potter (seen right), Will Hogg (seen below), and his brother Mike Hogg purchased 1,000 acres of land for a suburban development, dependent upon the privately-owned automobile. The three men envisioned River Oaks as a model suburb that would influence Houston’s city planning. Projecting that the population of Houston would reach 500,000 by 1935, the developers realized the importance of well-planned, restricted neighborhoods in the rapidly growing city. In preparation, the founders carefully studied suburban communities throughout the United States. It was announced that “The section will be something in the order of Highland Park in Dallas, but on a much larger scale.” They sought the advice of J. C. Nichols, who had developed the Country Club District in Kansas City, and they would later hire Nichols’ landscape architects Hare and Hare as consultants and designers for River Oaks. River Oaks is one of the most expensive and desirable suburban developments in the Southwest. Prices of smaller houses in River Oaks start on average at about three-quarters of a million dollars, making it the most expensive residential community in the city. However, from its inception, it had been planned to accommodate not only the wealthy but also those of somewhat more modest means. The initial goal of the River Oaks. Corporation was “to produce, for the Houston citizen, of discriminating taste, a complete residential community in the most advantageous locality”; furthermore, “care will be taken to fix the minimum building limit sufficiently low to allow the family of moderate income to enter.” They always anticipated that in the development there would be erected “homes ranging from palatial structures surrounded by large estates down to modest bungalows.” This paper will examine the early planning stages of the development and the architects who were most actively designing houses in the subdivision in the 1920s in order to illustrate how the developers conceived a project that was inclusive in terms of the economic status of its residents. Will arranged to buy out the stock of the Country Club Estates through a trade with the individual owners and the Country Club and formed a corporation called the Widee Realty Company. Then he, his brother, and Potter successfully proceeded to acquire additional land extending west to Tall Timbers, east to Shepherd’s Dam Road, and south to Westheimer Road. The northern section of the property abutted Buffalo Bayou, and across from it was Memorial Park, a 1500-acre woodland park that the Hogg brothers’ Varner Realty Company had purchased in 1923 and sold at cost to the city the following year. Even before Potter announced in the local newspaper that “our purpose is to create a large area of artistic beauty” and that he “expects to spend some time in traveling around the country to obtain ideas for the project,” he and the Hogg brothers had met with Hare and Hare and J. C. Nichols in Kansas City and on their way back to Houston had spent several days in Highland Park. Probably on the advice of Nichols, that summer Potter visited numerous residential developments in the United States, including Roland Park, Shaker Heights, Forest Hill Gardens in New York, and Palos Verdes Estates near Los Angeles, as well as several in European countries. By that time Nichols had established himself as the nation’s most prominent real estate broker and developer, and Potter formed a close professional relationship with him, frequently seeking his advice in the planning of River Oaks. As a result, River Oaks was most directly inspired by J. C. Nichols, pioneering work in Kansas City. Kipp’s 180-acre subdivision plan employed a network of curving streets with 219 lots of stratified sizes, from one-third of an acre to four acres. This plan provided lots for a range of income groups, from the wealthy who were nearest the golf course, to residents of more modest means who were farthest from it. By March of 1925 the River Oaks developers had sold approximately sixty-five percent of the original 180 acres to seventy-five of “the leading citizens of Houston,” and Hare and Hare had completed the master plan for the entire 1,000 acres. Similar in design to neighborhoods in the Country Club District in Kansas City, the proposed plan contained lots restricted to single family houses, small open spaces for neighborhood parks, formal esplanades, a church, a ten-acre complex of apartments, two shopping areas, and six sites for schools, including a fifteen-acre campus for an elementary school. During a visit to River Oaks earlier that year, J. C. Nichols commented that River Oaks “ranks high among the best subdivisions of this country” and that it was not only “technically correct, but very pleasing and in accordance with the best modern scientific planning” In order to expand the existing nine-hole golf course to eighteen holes, Will Hogg purchased an additional one hundred acres in 1926. Handicapped by inadequate roads approaching River Oaks from the city, the development had failed to garner the interest of some prospective purchasers. This was of such great concern to the developers that they convinced the city of Houston to have seven thoroughfares from downtown and the South End of the city paved to the eastern boundary of River Oaks. In addition, Hare and Hare prepared a plan for a landscaped 100-foot parkway drive to run from Sam Houston Park, along the south bank of Buffalo Bayou, all the way to River Oaks, where it would then cross the bayou and terminate at the entrance to Memorial Park. Will Hogg commented that “We are going to be thrilled beyond all measure when that thoroughfare gets in first class usable condition.” Construction of this thoroughfare, Buffalo Drive, now known as Allen Parkway, was begun by the city in late 1925 and completed in 1926. In March 1925, Will Hogg sent out fifty-four special delivery letters to prospective buyers to announce the opening of an elite ninety-two-acre “residential retreat” bordering the River Oaks “golf course “which for natural beauty, natural protection, immediate access, and park-way approach, can never be duplicated in Houston.” Known as Homewoods, it was restricted to fifteen estates varying from 3.5 to 14.25 acres and was protected by the bayou behind it and the smaller lots which surrounded it. After a disappointing response to Homewoods, Hugh Potter acknowledged, “We are going to find it difficult to dispose of these estates because of theft large size.” This is probably why Will and Mike Hogg reserved the largest lot for themselves and their sister Ima on which they built a house later that year. After the completion of their home, Bayou Bend, designed by John F. Staub, sales in Homewoods began to improve. With the view that River Oaks would be a civic improvement and annexed to the city, the developers designed it to be a model of land use for Houston, a city which had and still has no form of zoning. Unlike similar developments in other cities that remained politically autonomous, for example, Shaker Heights and Highland Park, River Oaks operated independently for only the first three years of its existence. The Hogg brothers and Hugh Potter felt strongly that the public regulation of private property would “prevent grocery stores, filling stations and chilli joints from crowding at random among private residences.” In other words, the developers felt that zoning would stabilize the pattern of land usage in residential subdivisions, but zoning was never approved by the politicians or the voters. A 1925 advertisement which appeared in local newspapers promised, “River Oaks Assures You Permanent Satisfaction, your future advantages are assured by protective restrictions and proper provisions for your home and even conserve your homesite value.” As Nichols had done in the Country Club District, Will Hogg and his partners formed a homeowners association and employed rigid deed restrictions to protect the financial security of River Oaks and to ensure that it remained a permanent, homogeneous neighborhood. By requiring membership of all property owners, the River Oaks Association was able to raise a maintenance fund through the collection of an annual tax on each property owner and used the fund for the enforcement of deed restrictions; the installation of street lights; the organization of a fire department, police service, and garbage collection; and the “beautification, care and upkeep of the streets, sidewalks, esplanades, parks and vacant lots.” The fund also paid for a staff of gardeners and repairmen who aided the owners in maintaining their commitment to the overall beauty of the development. The deed regulations encompassed renovation of existing structures to the placement of garbage cans and clotheslines, and the association vigorously enforced land use conformity. Every home design had to be approved by a panel of architects and the River Oaks Association and also had to meet a minimum price requirement of $7,000 for each house. On Kirby Drive, for example, the architectural styles permitted for houses were limited to English Tudor or Colonial Revival. Even sales signs, over-head utility lines, alleys, and eventually all commercial traffic were banned. A number of the country club members built houses in River Oaks between 1924 and 1926, but in contrast to these large and elegantly detailed residences, the corporation began to construct a series of smaller model homes to boost lot sales. The model homes were to serve as “standards for River Oaks” or suggested house forms for potential home builders. In 1924 Will Hogg requested that “Mr. Hare, Mr. Potter and Mr. Kipp should designate 15 home-sites of modest type, throughout River Oaks with the idea of building 15 houses within the next year or so.” Furthermore, he asked the men to select three different architects who would “conform in style and compete in detail” to sketch houses that would not exceed a construction cost of $18,000 to $20,000, but preferably $17,500 including the architect’ s fee, garage, and driveway, with the intention of selling them from $25,000 to $27,500. The four Houston architects chosen to design the models were Birdsall P. Briscoe; Sam H. Dixon, Jr.; Joseph W. Northrop, Jr.; and John F. Staub. The first model home was designed by the architectural firm of Briscoe and Dixon. It was labeled Redbird House, because of the redbirds which appeared on decorative grilles in the ground level French doors that flank the front door. The pink stucco house was loosely based on the French Provincial Revival style with Chinese Chippendale details. Five of the least expensive model homes completed by 1926, 3257 Avalon Place, 3232 Huntingdon Place, 3326 Avalon Place, 3352 Del Monte Drive, and 3215 Avalon Place, were Colonial Revival designs by Joseph W. Northorp, Jr., similar to those in Kansas City. In reference to two of them, Will remarked, “Miss Ima and I looked at the two Northrop sketches last night and they look like excellent, saleable houses for the estimated money, and it might be possible to start two of these small houses in advance of the others.” Will specified that the residences range in price, including the architect’s fee, from $7,500 to $9,000 on $2,500 lots of 65 by 125 feet. He thought they could sell them, including the lot, for between $10,000 and $12,500. Featured in The Houston Press on May 12, 1925, was Northtop’s drawing for a brick, two-story Georgian-inspired house nearing completion at 3352 Del Monte Drive. In addition to newspaper articles and advertisements, Will compiled a list of approximately 3,000 names and addresses for a direct advertising campaign. Invitations were sent out for a “private showing” of “the completely furnished house” at 3215 Avalon Place, a Northrop designed house, smaller in scale and simpler in embellishment than his design on Del Monte Drive. On June 1, 1926, the corporation mailed 4,600 invitations to a “private showing” of Northtop’s design for a two-story, stucco, Dutch Colonial Revival residence at 3232 Huntingdon Place. These examples were some of the least expensive model homes built in River Oaks. Probably because of their Small size and the continual escalation of property values in the development, 3215 Avalon Place and 3232 Huntingdon Place have been demolished. Many of these smaller residences have met a similar fate. John F. Staub, the architect for the River Oaks Country Club and Bayou Bend, designed two speculative houses for the River Oaks Corporation, 3374 and 3260 Chevy Chase Drive, in 1925 at the same time that he was building his own home in River Oaks. Shortly after being commissioned to design the River Oaks Country Club in 1923, Staub had purchased a lot in Country Club Estates and become a member of the River Oaks Country Club. He met Will Hogg at a dinner party in the Rice Hotel, a few months after Will and Mike acquired the development and agreed to undertake two of the model residences, ostensibly commissioned by Ima Hogg. Unfortunately, neither of these two model houses sold immediately. Staub and lma Hogg shared a predilection for New Orleans architecture, and, when they collaborated on the first model dwelling together, this was the style in which they chose to build. Moreover, Staub recognized the suitability of the style for Houston’s muggy climate. Advertised as being “Latin Colonial,” the model was based on the Absinthe House in New Orleans. Staub went to New Orleans himself to locate the antique iron grillwork which serves as the second-level balcony. Also borrowed from the prototype were the arched openings that featured fanlights and French doors. Feeling that “one of the greatest contributing factors to the romantic charm of these old houses is their color,” Staub chose his favorite New Orleans colors of”pale apricot” for the stucco walls and “dark blue-green” for the shutters. The original color of the house has now been changed. Every room of the model home was furnished, mainly with antique reproductions, by the Stowers Furniture Company shortly after it was completed in 1926. Although Staub did not design any more model residences for the River Oaks Corporation, he would eventually have over thirty private clients in the community. The last of his projects for the corporation were pairs of “Georgian” gateways at four of the entrances to River Oaks, as shown in a photograph that appeared in the Sunday edition of The Houston Chronicle on 1 May 1927. Highly ornamented wrought iron arches support iron lanterns over each gateway. Other Staub designed gateways were placed at the entrances to Kirby Drive, Buffalo Drive, and South Shepherd Road. In a letter to “All River Oaks Property Owners” on 10 May 1926, Hugh Potter announced that “the services of Charles W. Oliver, as community consulting architect are now at the disposal of any River Oaks property owner without charge.” ” This letter marks the official opening of our new Department of Architecture and Building under Mr. Oliver’s direction,” Potter continued, “a department which we believe will be an important and useful addition to the community service in landscape gardening which has been in effect for more than a year.” He described Charles W. Oliver “as one of the principal architects in the Russell Brown organization for six years” and stated that “four of the homes in the Spanish, English, and Early American styles of architecture, which have been built by Russell Brown in River Oaks, were done from plans drawn by Mr. Oliver.” Although Oliver produced several styles in designing residences for the River Oaks Corporation, his personal favorite seems to have been Spanish Revival. During the 1920s, the Spanish Revival style house became popular in Houston, as it had in several regions of the United States. Between 1923 and 1926, the architect Ralph Adams Cram designed one of the first Spanish Revival houses in Houston and the first in River Oaks, a grand red-tile roofed home faced in pink stucco for Cleveland Sewall. Upon completion of the Sewall House, Mrs. Sewall accompanied Arthur Byne and Midred Stapley to Spain furniture and artifacts for the house. In 1925 Byne Stapley published Provincial House in Spain in which they recommended the Spanish house “because it is so simple, to adapt it to the needs of the twentieth century.” ” A style that minimizes the use of expensive materials and makes but limited demands on expert handcraft is worth consideration in a country where material is costly and where good craftsmanship is not yet an age-old tradition.” The impact of the Sewall house on other house designs in River Oaks would be both immediate and significant. Pierre L. Michael, manager of the Houston Poster Advertising Company, retained Oliver in 1926 to design a Spanish Revival style home that was built on one of the smaller lots in the subdivision, 1903 Bellmeade. Pleased with the design, Hugh Potter wrote to Will Hogg, “The house he [Oliver] is about to complete for Michael is the only small Spanish type structure I have seen any where that really looked decent.” Potter said that “Michael insisted upon a Spanish job on a small house, and Oliver has done it excellently.” Spanish details are evidenced in the open flagstone terraces, ornamental grills of iron and masonry, one-quarter turret, and decorated wrought-iron loggia and balcony railings. As seen in a 1927 photograph of the vestibule and living room, there are masonry walls with arched openings and doorways, tiled floors, wrought-iron sconces, and an ornamental wrought-iron railing between them. Obviously delighted with Oliver’s design for the Michael House, the River Oaks Corporation decided to build their next speculative home in the Spanish Revival style. Unfortunately, it was demolished in 1997, but drawings and photographs of the building were published in The Western Architect in 1927. In this design Oliver presented a romantic image of a Spanish farmhouse that was added onto over time. The irregular character of the exterior of the one-and one-half story house was created by a series of multi-level, red-tiled roof lines with differently shaped chimneys; a winding stucco staircase which led to a unusual second-floor porch facing south; and a variety of window forms. The center portion of the V-shaped house contained the entry hall and the large, rectangular living room where a double faced fireplace that opened onto the piazza. Published in 1937 in Rexford Newcomb’s, Spanish-Colonial Architecture in the United States was Oliver’s own house in River Oaks that he had designed and built for himself and his family in 1927. Again, Oliver designed a red-tiled, rambling farmhouse with ornamental grills, surrounded by a low, stucco wall with an entrance gateway featuring an iron gate instead of wooden doors. The T-shaped plan used on 2508 Pelham Drive provided for a large living room and master bedroom above it. The living room, seen in a 1929 photograph, has an exposed wooden beam ceiling, a red-tiled floor, and a winding staircase with patterned tiles on the risers and wrought iron mils. Walls of Caen stone have wrought iron lighting fixtures, and a cornice of hemp rope from which art work was hung. Spanish style rugs, furniture, and various decorative objects complete the room. At the northeastern comer of the living room is a traditional Spanish Colonial chimney-piece that rises into the master bedroom above it. A photograph of the chimney-piece in the master bedroom, “described as being “reminiscent of Mexico,” reveals that it is a massive feature of the room. Next to the child’s bedroom was a sleeping porch, a common feature in the 1920s, which was thought to benefit health by providing a cool, fresh-air sleeping area. In March 1929, seven months before the stock market crash, Oliver completed one of the last small houses he would build for a River Oaks client. Designed in the Old English cottage style for the attorney J. L. Shepherd, Jr., the house, located at 2105 Brentwood, was erected for just under $19,000.00, excluding the cost of the lot. Before leaving his position as staff architect for the River Oaks Corporation in 1932 to start his private architectural practice in Houston, Oliver built over seventy-five homes in River Oaks. All of his house designs were period revivals, reflecting English, Spanish, or Early American originals. Briscoe and Dixon had chosen the French Provincial style for the first River Oaks model home, and Staub had used New Orleans details for his Latin Colonial design~ This eclectic mixture of historic architectural styles was undoubtedly favored by the committee that approved the design of every house built in River Oaks. Developers like J. C. Nichols, Hugh Potter, and the Hogg brothers, although not opposed to modem appliances, feared that using the modem style for the building of houses would be risky and “actually offensive ten years hence.” It would be another decade before so-called modem residences would appear in River Oaks. The River Oaks developers were particularly interest in attracting young professionals with potentially steady salaries like J. L. Shepherd, Jr. By employing Nichols’ “packaged house,” or offering financing of the lot and the house together, which he had ‘initiated in 1915, the River Oaks Corporation profited from financing their own sales; allowing them to offer more affordable payments to middle-class customers. “The [home] financing campaign is perhaps the most significant phase of our present operations,” wrote Will, “creating more building activity in the property [River Oaks] than there has ever been before and more than there is in all the other subdivisions put together.” As in Nichols’ system, the corporation required a ten-per-cent down payment for a model home or a house designed by their architecture department; a first mortgage was set up for five years at an interest rate of six or seven per cent, depending on the current rate; and two points, or two per cent of the mortgage amount, was charged for arranging the financing The principal amount ballooned in five years, with a second mortgage due that required interest on the principal until the balance was paid in full. In 1927 there was another pre-development sale as a new section of River Oaks was platted, developed, and offered to the public for sale. Hugh Potter reported to Will that “in general the sale was far more carefully planned and better executed than our last one [in 1926], and had the market been as good, in my judgment we would have sold 75% of the property offered.” But later that year, Potter told Will “speaking among ourselves, there is an awful lot of depression talk going on in this town.” Potter said that he had “talked during the past week to most of the men in the residential real estate business and to a number of our retail and wholesale merchants.” They “without exception report business less than this time last year and prospects poor.” On 26 June 1929, Will told Potter “we want no more houses built by River Oaks except on contract, that is, houses built for specific clients such as you named to me.” By this time the River Oaks Corporation had grown to be an organization that operated much like Nichols’ Country Club District with seven major departments: architecture, accounting, publicity, sales, maintenance, landscaping, and home service, with divisions under each of them Mike Hogg had left the corporation in 1927 to pursue a career in state politics, Will Hogg died unexpectedly after complications from gall bladder surgery in 1929, and Hugh Potter finally acquired enough capital to purchase the Hogg family’s interest in the River Oaks Corporation in 1936, which he operated until his retirement in 1955. When the depression struck, there were 300 families living in River Oaks, with one-half of the 1,100 acres fully developed. In the late 1920s, the River Oaks Corporation had adopted such slogans as “Homes for All Time,” “Over 1000 Acres Restricted,” “A Residential Park,” and “Values were not only created in River Oaks, they are maintained” to send a message to upper-class and middle-class buyers that River Oaks offered a secure investment. These statements of intent, although not promises, were fulfilled. Moreover, River Oaks has always rebounded after real estate depressions in the city, even as recently as the late 1980s. Today the demand is high for home sites in River Oaks, although the market supply is almost nonexistent. For today, River Oaks is not merely close to Houston, it is m the center of the city and just a short drive to downtown and other business districts. The principals of the corporation, all being attorneys, not only recognized the value of deed restrictions and homeowners associations, but also worked diligently to see that such restrictions were enforced in River Oaks. Undoubtedly, River Oaks was and remains the most restricted subdivision in the Magnolia City. Legal and aesthetic regulations in restricted subdivisions across the country were prudently analyzed by the three attorneys before writing their own sets of regulations for River Oaks. Upon the retirement of Potter, he advised the residents of River Oaks not to dissolve their homeowners association and deed restrictions. The River Oaks Property Owners Association was maintained and has served the community through the continued enforcement of deed restrictions for over forty years. Creating an aesthetic community environment was an utmost priority to the three men Their mission was to preserve and enhance the beauty of River Oaks. To insure this, they engaged Hare and Hare to oversee the landscaping and planning of Country Club Estates and the master plan for River Oaks. Trees were planted in barren sections of the property, and shrubs and flowers were gracefully placed in parks and esplanades. To further protect the subdivision’s overall elegance, free landscaping advice from a staff gardener was offered to each homeowner. Recognizing the importance of the Country Club in furnishing a place for social interaction and outdoor sports for the entire family, it was expanded to offer larger areas for entertaining and more forms of athletic activities. The best available utilities were installed at each lot, and roads were improved and built to link River Oaks directly to other sections of the city. In 1927 a bus service to and from downtown Houston was inaugurated to improve transportation options for the residents. In order to make other amenities readily available, areas were reserved for schools, shopping centers, and a church. Smaller sized lots, 65 by 125 feet, to multi-acre sites in the secluded Homewoods were platted for a range of income levels. The River Oaks developers provided protection for their well-to-do property owners by surrounding them with secure, restricted middle-income lots, intended for professionals and their families. Model homes were erected to help families study architectural design and planning and to aid them in determining what type of house suited their individual budget and needs. A staff architect was hired in 1926 to assist property owners in designing their own homes. Moreover, corporate-sponsored financing encouraged families of modest means to purchase lots and build homes in River Oaks. From the beginning, the Hogg brothers and Hugh Potter intended River Oaks as a residential community for middle- to upper-income families. But during the 1920s, River Oaks was so carefully organized, planned, restricted, and well-maintained that in time it became the most expensive neighborhood in Houston. After World War II as Houston experienced its greatest boom, River Oaks would increasingly become a haven for the wealthy of the city, and the middle classes would have to look elsewhere for affordable housing. This excerpt from a research paper by Cheryl Ferguson appears here with her permission, and is very much appreciated!